As I write this, there are many in the Senate and House of Representatives, both Republicans and Democrats, attempting to have legislation passed that will essentially grant amnesty to 11+ million illegal immigrants here in the United States. Make no mistake, this isn’t about being fair; this is about getting votes. While I surely understand that there are families here that do not wish harm to come to our country, they are causing harm by crossing our border illegally and the plans currently being floated around the House and Senate have no plans to put an end to the problem of our borders. 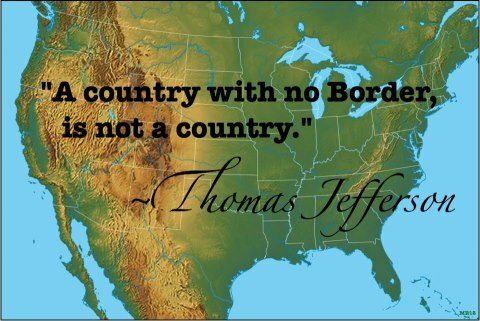 Before we can do anything about the people here, we need to shut down entry from our northern and southern borders. We also need to double up our security at our seaports and our airports. This has to be accomplished before we can even begin to talk about “pathways to citizenship” or amnesty. Whenever there is a talk of amnesty programs, there is experienced a surge at our borders of people trying to make the deadlines. I have a reputable source that works as a border agent confirming this for me as talk of amnesty has become public. He has seen increases of illegal crossings, and due to the Department of Homeland Security policies, he has stated that there isn’t anything he can do to stop it. So what can we do about this? First, we need to contact our legislators and let them no that we do not support any deal that doesn’t immediately begin to FIRST increase the security at the border. No legislation without that. Ronald Regan’s administration heard the same promises of closing the border down, and increasing the security, but all the promises were broken. We have to hold our representatives to having security before amnesty period. It shouldn’t be a though in their heads until that happens. I certainly feel for the people who wish to come over to better their lives, but doing so at the expense of the American taxpayer is not ok. We have our own dreams, and paying for illegal’s healthcare, education, etc. is breaking the backs of the American people. The compromise that must be reached is border security. One step at a time Senators! Please contact your representatives today. Oppose any legislation without borders closed first.